Extended-stay travelers play by different rules and need a hotel that understands your unique needs. Staybridge Suites Amarillo Western Crossing is designed from the ground up just for you. We are just minutes from the Baptist St. Anthonys Hospital, Northwest Texas Healthcare System, Bell Textron, Tyson Foods, Owens Corning, Texas Tech Pharmacy School, and AT&T. 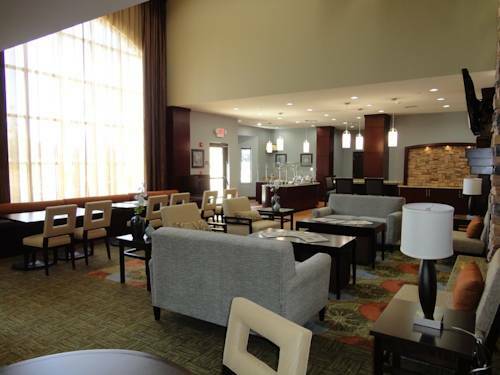 Staybridge Suites gives you the amenities that make you feel at home. Fully equipped suites with full kitchens, room to spread out, space to work and space to relax. Plus theres shopping and dining within walking distance. Just a short drive from the hotel you will find the American Quarter Horse Hall of Fame Museum, Big Texan, Historic Route 66, Panhandle Plains Historical Museum, Cadillac Ranch, and so much more. Lake Meredith Recreation Area, and Palo Duro Canyon State Park is just a short hour drive away. When its time to get connected we know what you need free wired and wireless high speed Internet, cable, sports and movie channels. And when you need to burn some energy the fully equipped fitness center and outdoor courtyard will help melt the stress away. For a relaxing evening, join us for our Social Reception then relax in our Just like home Library. For a late night snack you can always grab a treat in our Pantry, open 24 hours. When you come to the Panhandle of Texas, we know what you need. Staybridge Suites Amarillo-Western Crossing is your best stay for a week, a month or even a year.